Sitting along the West Norfolk Coast are the magnificent Hunstanton Cliffs. Despite the fact that they are not very large, as some cliffs come, they have still earned the title of the 7th best geologic location in the UK1. The reason for this is the unusual type of rocks that are found there. As you can see from the photo of the cliffs, they are rather beautiful to look at. The cliffs are made up of three main rocks layers. The bottom brown layer is a coarse sandstone with fairly large pebbles in it, called carstone. 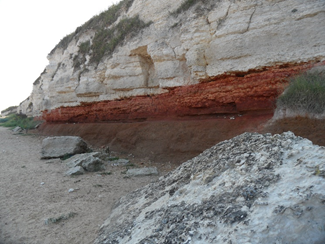 The next layer is red chalk, or the Hunstanton Formation. This is quite a distinctive feature of Hunstanton, and is red due to its iron-rich content, so it is basically rusty2. The third and last layer is the grey chalk. 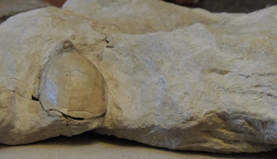 The two chalk layers are very rich in fossils, and there is one fossil in particular that we will focus on in this report. First, however, we need to look at how this chalk was supposed to form, according to secular geologists. Chalk is mainly comprised of microscopic creatures called coccolithophores. These creatures have shells called coccoliths. These make up the bulk of the chalk. They are supposed to accumulate into a lime-mud, gunge, very slowly on a seabed. This is then supposed to harden into the chalk cliffs that we see today. All this is supposed to take a very long time3. These vast periods of time are incompatible with the Biblical record of Noah’s Flood. Many have suggested that the chalk cliffs have done away with the Biblical flood, because of the large time-scale4. However there are several things that we can see at Hunstanton that challenge this. In October 2014, John Mackay led a field trip to Hunstanton5. On this trip, he discovered a very special fossil, but it was too large to collect on the day. I then went back a few weeks later, and retrieved it, cleaned it up, and it now is he ld in the Genesis Museum of Creation. It is an extinct squid-like creature called a belemnite, approximately 5cm (2 inches) long. But can you see the problem? The cliffs are supposedly dated at 108 million years at the bottom, and 99 million years at the top6. This covers a period of 10 million years. The cliffs are approx. 20 metres, or 60 feet at the tallest point. Therefore it took 10 million years to lay down 20 metres of rock, or you could put it as 20,000mm in 10 million years. This also means, if we do a bit of simple math, 2mm of rock took 1,000 years to lay down. Half that, and you get 1mm per 500 years. The problem comes when you realise that the belemnite is approx. 5cm (2 inches) long. 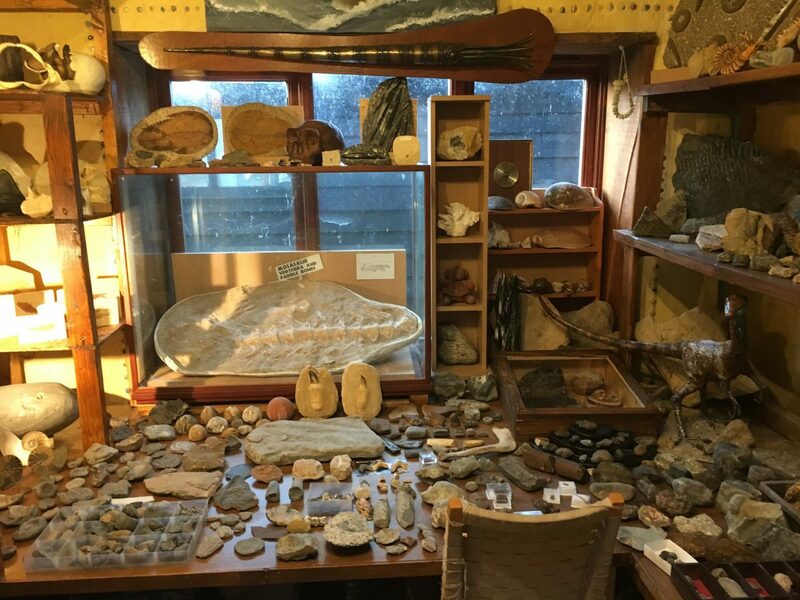 At this rate, it would take 18,750 years to bury the belemnite! This is clearly ludicrous! The belemnite was before it dissolved or disintegrated. And it gets worse. If you look very carefully you can see the layers in the rock. 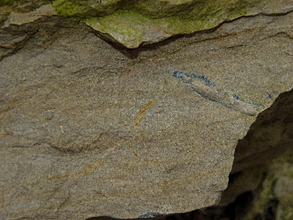 The belemnite crosses many layers of sediment. This is what we call ‘polystrate’, poly meaning ‘many’, strate meaning ‘strata’, or layers. There is no way that this could have been deposited over a vast period of time. This fossil was buried before it fell over so it had to be fossilised very quickly. This belemnite, as well as this brachiopod (seashell) that was also found at Hunstanton, are both polystrates, and are great e vidence that it would have taken a huge watery catastrophe to lay such a vast amount of sediment down in a short enough amount of time to actually fossilise these creatures. Noah’s flood has not been ruled out by these strata at all. You can trust the Bible on any topic, creation, the flood etc.! It is God’s very own message to mankind. It explains the sin than man is caught up in. The very same sin that caused God to judge the world with the Global Flood. But just as God provided a way to escape the Flood, the Ark, He has also provided a way for us to escape the destructive power of sin. He Himself came down to the Earth, as the man Jesus, and lived a sinless life, before dying on a cross to take the sins that you have ever committed or ever will commit, and will grant you everlasting life. All you need to do is confess that you are a sinner, repent, which means to turn around from the sinful life that you are living, and take the amazing free gift of eternal life that God has paid for! Next Next post: Research trip Report. Genesis Museum of Creation Research Fast Fossil Facts!